Brushstrokes from the Bush features botanical artworks of Australian plant species that grow in the bush as well as introduced species that are impacting on the growth of native flora. Using a range of media including watercolour, graphite, acrylic and scraperboard, each artist accurately represents their subject’s form, colour, texture and growth patterns. The ultimate goal for these artists is to foster awareness and appreciation of our diverse native bush flora and to pay homage to this beauty. 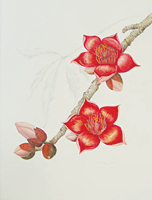 Image: Gwenda White, Bombax ceiba (detail) 2010, watercolour on paper. Courtesy of the artist.